Daniela Hantuchova & Erik Narjas - eliminated 24th September. Vladimír Kobielsky a Dominika Chrapeková - winner. To view images must be a member of our community! Register for free! Branislav Deák and Dominika Rošková - 2nd. Silvia Lakatošová and David Schavel - 3rd. Eva Kramerová and Lukáš Hojdan - eliminated 29th October. Emma Drobna and Filip Buranská - eliminated 22nd October. Petra Vajdová and Fabio Bellucci - withdrew due to injury. Michal Konrád and Patrícia Martinovičová - eliminated 8th October. Lenka Vavrinčíková and Adam Brešťanský - eliminated 1st October. Tomáš Dohňanský and Katarína Lacková - eliminated 17th September. Peter Varinský and Paulina Gašparíková - eliminated 10th September. 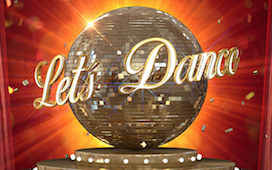 Let's Dance is a licensed format, which comes from the UK and Slovak original version of Dancing with the Stars . On the screens of TV Markíza appears since 2006 and this autumn will be broadcast every Sunday for the sixth series. The winners of the first season were known Slovak actress Zuzana Fialová with its professional dancers Peter Modrovský . The winners of the second season, he became a Slovak actress Michaela Čobejová her dance partner Tomáš Surovec . In the third season victorious actor and humorist Juraj Mokrý a professional dancer Katarína Štumpfová . In the next season, he triumphed on the dance floor actress and singer Nela Pocisková and the second time the king of the dance floor stal Peter Modrovský . The winners of this latest, fifth, season were TV presenter Janka Hospodárová a professional dancer Matej Chren. On show host post they have been replaced by Adela Vinczeová , Martin Pyco Rausch , Zuzana Fialová or Libor Bouček . Dance performances also evaluated different judges: Ján Ďurovčík , Tatiana Drexler , Zuzana Fialová , Dara Rolins , Zdeněk Chlopčík , Dagmar Hubová , Elena Jágerská or special guest of the jury and the winner of the third Step Up Juraj Mokrý . A single jury member who appraised yet all series has been acclaimed director Jozef Bednárik . This year for the first time assume jury chairs former dancer, trainer and choreographer Petr Horáček . Director's chairs in the sixth series for the first time takes Pepe Majeský who are succeeding after five seasons Petra Ňunéza . Erik Ňarjaš (32) already in Let's Dance dancing with Marianna Ďurianová, Zora Czoborová and Simona Krainová. At present, besides dancing he devoted mainly banking and business. In the past, already well he trained in China and New York. On account has a dance DVD, on which collaborated with dancer Ivana Surovcová (now Gáboríková). In the past, has three dance schools by the end of this year plans to open the largest raisovací portal to help charitable projects for implementation. Ladies and gentlemen, begin: With these dances today grapple star Let's Dance! Daniela Hantuchova and Erika Ňarjaša waiting cha-cha , danced to the rhythm of hit songs Shut Up and Dance from Walk the Moon . To see links you must be a member of our community! Please register for free! The good news is that Daniela's not eliminated because the points get carried over to the next episode and that's when the first elimination happens. Did she get through to the next round?? The first elimination is after the next episode, eddy. Najväčšie fiasco Let's Dance Daniela Hantuchová: The royal fee showcased this? After all, it's the pink slip! It was to be the biggest star of the whole show. Awning to Let's Dance zlanárila world tennis player Daniela Hantuchova (34), from which you promised famously performances exactly as on the court. From the beginning it had much higher requirements than the rest of the competitors and even fought for the greasier fee. But what showcased on Sunday live, can not be called otherwise than a fiasco! Already in previous editions Let's Dance was sort of rule that in each series appeared some of our well-known sportsman or sportswoman. Otherwise it could not be this time. As the figure skater Jozef Sabovčík Job occupancy declined as well, the television did not agree either with Philip by SEB , Markíza finally zlanárila world tennis player Daniela Hantuchova. From the beginning, so it is talking about it as a workhorse throughout the competition and about how to impress floor not only figure, but also dance creations. As proof that Daniela is from the very beginning for television gold mine, it used the fact that the former sportswoman have fought for the highest fee. "Daniel can extra income to 40 thousand euros. Each part has in fact four thousand. Many others are not far, " we have learned from a source. Well that's not all. Hantuchova had a stellar manners in other cases. While others trained in Bratislava, she trained in Rome where for her television broadcast-trainer Katarínu Jakeš, her dance partner and other members markizáckeho staff . And to make matters worse, the tennis player to make trouble, even if it was a dance partner. At the last minute he had to change, as wanted to dance only with Erik Ňarjašom. When Sunday started the first live broadcast of the show , all viewers with a voltage expected, as their stellar Hantuchova impress. But when we went to the floor and made some movements, people remain as scalding. Daniele was not at all, could not stir, netriafala to the beat and when she worked as a dancer totally wood. This ultimately reviewed and juror Ján Ďurovčík which, although praised her perfect figure, but as dance is concerned, he said to her on the plane. "I will therefore charges. It was not good. Basically, everything was bad. Also perfect body ... There were rhythmic shortcomings feet just like for you, just here and there, as they went, the term was nervous, " assessed Ďurovčík who gave tennis star only one point. Its performance, however, properly angry competent in Markíze. "In Záhorská Bystrica enough rage. For such a fabulous royalties filed a terrible performance. The whole walk through, it was also the pink slip from the competition, " we have learned from a source. Whether therefore Daniela kicks as the court or fails immediately in the next round, we'll see as early as next Sunday. "Every week has to be one last dance couple. In the opening episode of the last place vytancovala Daniela with Erik. We believe that it motivates them to fight for a better location for a week, " said Michal Borec, Director of PR and marketing Markiza. Carefully review the following SMS numbers allocated to dance pair. Thanks to them because their favorite move into the finals and to provide them with the title of king and queen of the dance floor. And that's not all. By sending an SMS vote is in fact getting into a drawing for 5,000 euros! More about the contest, read here . Remember every Sunday during the live transmission of Let's Dance to vote and thus support their favorite couples. The more you send SMS votes, the greater the chance of winning great you 5000 euros. These dances tomorrow await our dance couples in Let's Dance! See with whom dances tackle the familiar faces with their dance partners. Daniela Hantuchova and Erika Ňarjaš waiting tango to dance to the song Poker Face by Lady Gaga . Daniela made it through to the next round. Varinsky and Gasparikova were eliminated. I don't know what the scores or the votes were yet. Daniela & Narjas got 18 points. Yay, Dani! I always said she was more popular worldwide than a lot of people thought. Former tennis player Daniela Hantuchová (34), while the biggest star markizáckej dance show Let's Dance, but on the floor yet breathtaking moments nepredviedla what the jury made it clear, but also the audience. However, she said such harsh criticism of her as a sportswoman motivates to work hard for each other. And we have proof! We had the opportunity to visit its training, where the government really professional and focused atmosphere. "When I do something, so I try to one hundred percent. Of course, dancing is not exactly the most natural thing for me, the more I toil," she told us Daniela, who admits that her dance partner Erik Ňarjaš is a tough coach. However, conflicts between safe. "It is rigorous, especially in terms of technology and overall performance. During the whole career, I never had the feeling that a lot when I'll do something, so I'm going to the end, " added Daniela determination. Hantuchova is not in Let's Dance only draw for spectators, as well as a star among the other competitors. It complements them with their energy. Competitors very popular with its new energy candy D-one that you wear for training. In her case, the habit of tennis, but other zachutili so that they disappeared before our eyes. "Suddenly it started to spend so fast that I had to leave to import much more, ensuring that all missed. This is a fast energy, which is the only sugar tamarind, so it is energy without extra kilos. On the court, I always ate dates and these experiences, I gave up the recipe for candy. It did not occur to me that I will be giving away their time dancer in Slovakia, but I'm glad they taste, " laughingly complained was Daniela. Although the tried did not escape her harsh comments from the jury, in particular the "executioner" Jána Ďurovčíka. As a professional sportswoman, however, with these words stride. "Me criticism helps and always helped. I understood most of the coaches who to me, go '. Immensely appreciate the words of all the members of the jury. I do not take criticism as something negative, " she says. Criticism of the jury kicked so much that she decided to stay in Bratislava and properly train in Slovakia. So far, in fact he trained in Rome, which was also its condition prior to signing a contract with the television. Her dance partner for her regularly flew. "It comes to shove and there is no time to travel, I said that it really should be taken seriously," she said with a smile Daniela. But in the same breath he added that since the beginning of trained hard, but previously had professional duties due to which she spent a lot of time outside Slovakia, and this week it came out that he has the right are a number of activities. Hantuchova itself from the beginning said that dance is "log" and did not start until the train on Let's Dance, you never danced. That was her decision to participate in the TV show a big surprise for her coming. Her dance partner Erik Ňarjaš is a great looker, so we wonder if anyone jealous of him. "When you dance with a partner, so more people jealous," she told us mysteriously Hantuchova. Or she thinks someone in particular, did not want to comment. Before us is a movie night: What dance dance your favorite? See what dances you see in the third round. For the first time in this series Let's Dance awaits us thematic round, namely, you can enjoy an evening of film megahits a great film music. That you can not wait? Then see what tomorrow dances await your favorites for overall victory! Tennis player Daniela Hantuchová and Erik Ňarjaš already tried the legendary dance scene from the cult film Pulp Fiction . This time, therefore waiting jive , who danced to the song You Never Can Tell .